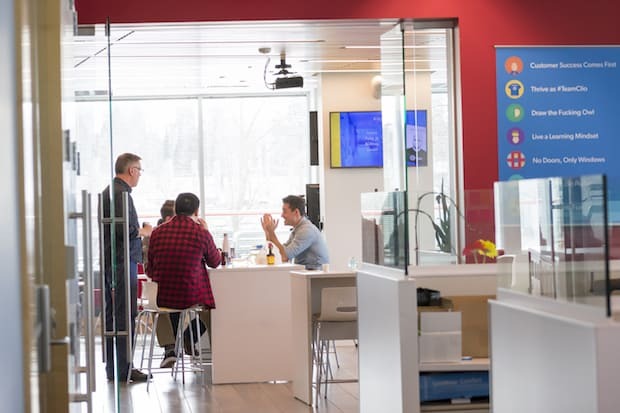 In our Creative Cultures series, correspondent Crystal Henrickson spends a day inside companies to learn how company culture play a role in employee happiness. From startups to design firms and all in-between, we’re pulling back the curtain on what it’s like to work in inventive and productive environments. Today she’s with the lovely folks at the legal software company, Clio. Launched in 2008, Clio offers cloud-based practice management software for lawyers and legal professionals. Since then, they’ve gone from a promising startup to one of Canada’s fastest growing tech companies three years running — all while earning an enviable reputation for their people-first, growth-minded company culture. With over 200 ‘Clions’ across Canada and Dublin, I arrived at their colourful Burnaby head office to meet a few, and discover why they find Clio such a great place to work. The perks are great — but it’s the people that matter! Tech offices are often renowned for their modern design and fun perks, and Clio is no exception. At over 17,000 sq ft., Clio’s facilities include a video game lounge, foosball table, a sound-proof ping pong room, and a large and bright cafeteria — with a coffee shop/bistro environment, complete with a wide range of healthy snacks, as well as beer, wine and cider on rotating taps. 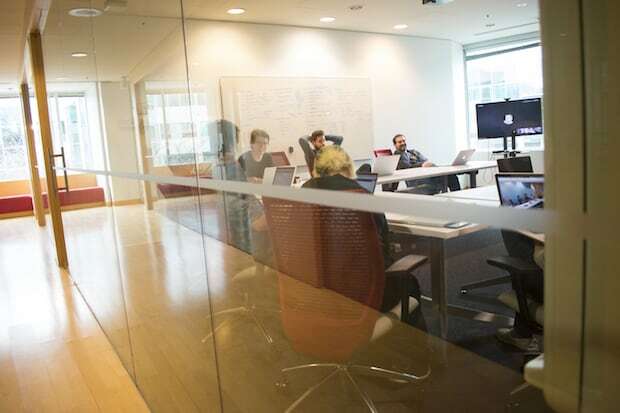 Workspaces are designed to be open and collaborative between teams, with executives and leaders situated at the heart of the action. While the standing desks, zen room, and cute office dogs are certainly amazing benefits to the job, over and over I heard Clio employees overwhelmingly valued one thing above all: the people. What makes Clio such a great place to work, is the fact that we’ve hired truly exceptional people who are all in it as a team. “Every person who starts in the tech space for the first time is awed by the office space, ping pong table, and various other perks. That stuff is cool, but what makes Clio such a great place to work for me, is the fact that we’ve hired truly exceptional people who are all in it as a team. People who regularly give it their all, people who are, in some way, a bit quirky, and people who truly give a sh*t.” explains Christopher Yeh, Manager of Talent Development. 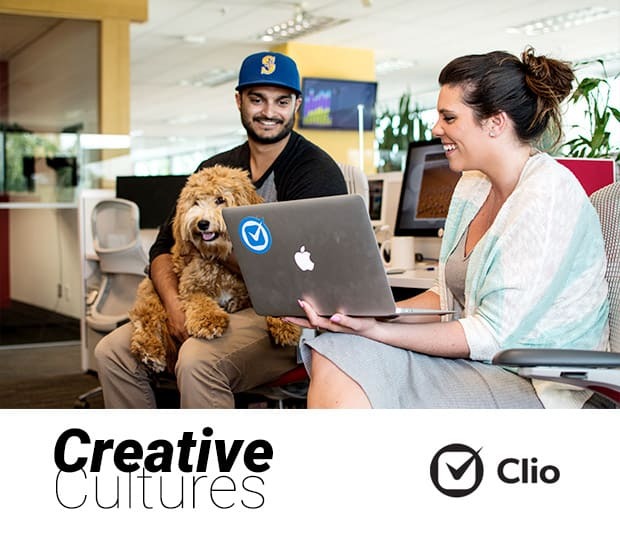 At Clio, ownership and transparency are key to core values that motivate and drive the team. Borrowing from the popular internet meme, the core value that stood out to me the most was ‘Draw the F*cking Owl’. In other words, the leadership team draws the broad strokes, but it’s up to individual employees to take the initiative, seek out solutions, and fill in the details. “There isn’t a road map to the answers we need, but this allows for a lot of ownership and analytical thinking, which contributes greatly to personal growth.” says new employee, Fiona Chiu, who recently joined the team as a Business Operations Analyst. For those who want to grow their careers upwards or sideways, there are plenty of opportunities to expand and transition. New managers are given tremendous support with business partners connecting with different departments to help people grow. They’ve even recently brought on a performance coach to help train and support new leaders. Ownership and transparency are key to core values that motivate and drive the team. “We put a lot of work into ensuring an excellent candidate experience. To that end, candidates that apply with us can expect expediency, transparency, and respect. Our hiring process is not easy, as we regularly look for people who raise the bar for everyone else around them. 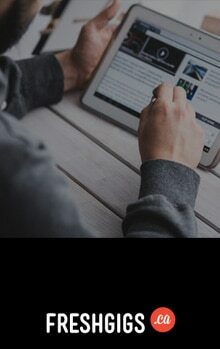 In general, you can expect an initial phone conversation from one of our Talent Acquisition Specialists, an interview with the role’s hiring manager, a project that taps into some of the work a prospective Clion would be doing in that role, and a meeting with one of our co-founders.” shares Christopher. Think you have what it takes to be a Clion? They’re currently hiring for a variety of different positions across Canada, ranging from marketing, support, sales, operations and product roles.